After decades of wars and destruction, the relative peace in Afghanistan has helped restore sports facilities and encourage youth to polish and prove their mettle. Latest triumphs have brought a rare and much-needed joy to this war-ravaged nation in the New Year so far. The Afghanistan Cricket Team defeated Zimbabwe in a 5-Matches One Day International (ODI) series on Wednesday 07 January 2016 to finally join the top 10 teams of the world in this form of sport. Elegant display of batting by young all-rounder Gulbadin Naib earned Afghanistan this slot at the International Cricket Council (ICC) ranking following a victory over Zimbabwe in Sharjah in the last match of the ODI series. In this last One Day International (ODI) of the 5-match series, Afghanistan achieved a mammoth target of 249 in the last over of the game. Gulbadin scored impressive 82 not out to see Afghanistan through the win. Both Gulbadin and another young talent Rashid Khan’s 85 runs partnership for the 7th wicket that basically laid the foundation for this victory. Afghanistan had lost the hard-earned 10th slot at the ICC ranking when it lost two out of four ODIs to Zimbabwe earlier this week. With this victory, Afghanistan has once again occupied this slot and has become the only non-full member of the ICC to sit on this position. Hundreds of thousands of Afghan supporters across country, mainly in the big cities like the capital Kabul took to the street at mid-night to celebrate the victory. “When was the last time that so many Afghans were so happy and celebrating across the country? It has been too long, let’s celebrate it the best way we can” Neek Mohammad, a Kabul resident said talking to Fair Planet. 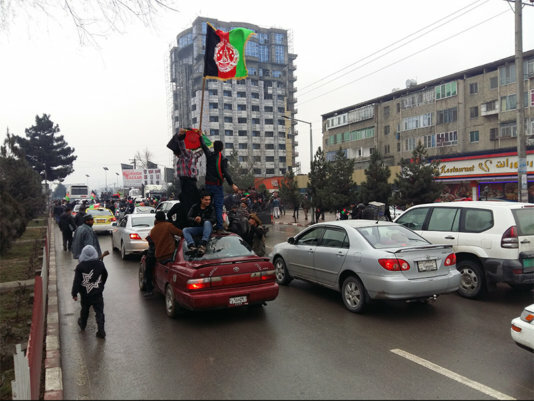 He was driving a car packed with his friends in the freezing temperature, hoisting their national flags and shouting their lungs out with “long-live Afghanistan’ slogans. Ibrahim Momand, the country’s leading sports commentator was rocking the radio waves throughout these nail biting sports encounter. “These are arguably the biggest achievements our sports team has brought to us”, Momand told fairplanet. Just couple of days back, thousands of Afghans showcased similar display of national unity and festivity as they flocked the streets in downtown Kabul to welcome their national football team back from India. Afghanistan was crowned as the runner-up for South Asia Football Federation (SAFF) Cup on Sunday 03 January 2016. Fans were hoisting the tri-color national flags and chanting slogans to acknowledge the performance of their national heroes. 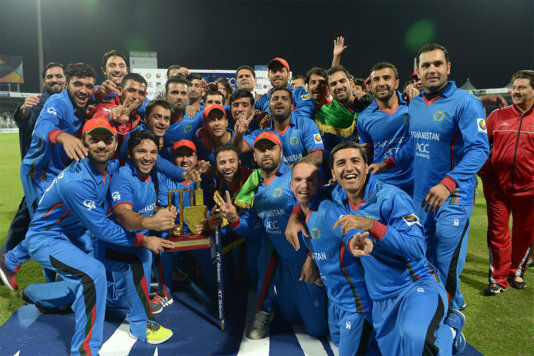 Many however, indicated that the festivity could have been on a greater scale had the Afghan squad clinched the title. Despite the impressive performance at the group stages, and dominance in the final, Afghanistan lost final to the experienced Indian squad in a 2-1 thriller. Afghanistan has been phenomenal in their performance at the group stages; over powering Bangladesh by 4-0, Bhutan by 3-0 and Maldives by 4-1 to reach the semi finals where it defeated Sri Lanka 5-0. The Afghans scored the most goals (16) and conceded the least (3) in their five games during this championship. A suicide blast at the Kabul’s Hamid Karzai International Airport minutes after the football arrived and left for the stadium was just another reminded of the trauma and misery this country is going through. Not to mention, the country has seen deadly attack on a volleyball match in the Paktika province last year that claimed more than 50 lives. After decades of wars and destruction, the relative peace in Afghanistan has helped restore sports facilities and encourage youth to polish and prove their mettle. Cricket and football are among the most favorite sports here. As Momand spoke from his multiple years of experience as sports commentator, the Afghans are overwhelmed to have finally got their own national heroes to follow and admire. “It were not only the youngsters, the elderly, women and children and equally following the national teams by watching live matches on TV or listening to radio commentaries in rural and far away areas in the country”, Momand said. An overwhelming population of Afghanistan comprises of youth. In Momand’s views, there is no better way than giving a hope to these youngsters about a brighter future via such sporting triumphs.